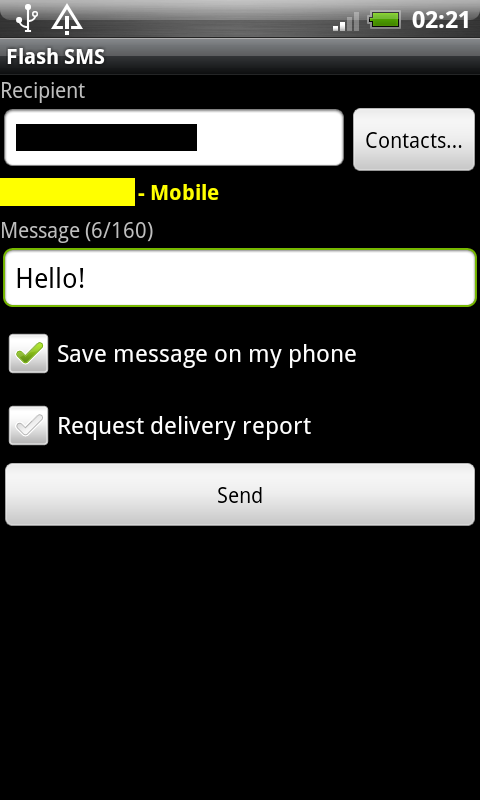 Flash SMS is an Android application to send flash SMS (class 0 SMS). This application can also send messages containing special characters (Unicode, Chinese, Russian, ...). Because of new Android limitations, this application only works with some devices! A flash SMS is displayed directly on the recipient's phone without the latter having to open it and is neither saved on the SIM card neither on the recipient's phone. Works perfectly, its lite by design. Developer replied to my comment makes me feel impor+an+. U rock. Romanski (February 17, 2012) - Awesome. Does what it says. Purrfect! Atreiu (February 6, 2012) - Love it! Alexey (November 11, 2011) - Super! I've been searching for such application for a long time. Thank you very much! Rico (September 3, 2011) - Excellent app. This is the first flash sms app I found from android. I'm previously using flash in Windows 6.5 Nice work.